The Galilean moons are the four moons of Jupiter discovered by Galileo Galilei in January 1610. 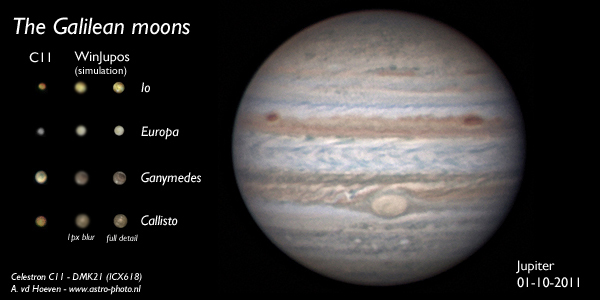 They are the largest of the many moons of Jupiter and derive their names from the lovers of Zeus: Io, Europa, Ganymede and Callisto. Ganymede, Europa and Io participate in a 1:2:4 orbital resonance. They are among the most massive objects in the Solar System outside the Sun and the eight planets, with radii larger than any of the dwarf planets. The four moons were discovered sometime between 1609 and 1610 when Galileo made improvements to his telescope, which enabled him to observe celestial bodies more distinctly than had ever been possible before. Galileo’s discovery showed the importance of the telescope as a tool for astronomers by proving that there were objects in space that cannot be seen by the naked eye. More importantly, the incontrovertible discovery of celestial bodies orbiting something other than the Earth dealt a serious blow to the then-accepted Ptolemaic world system, or the geocentric theory in which everything orbits around the Earth. These images of the Galilean moons are made with a C11 at f/25 to try to catch some details on the moons.